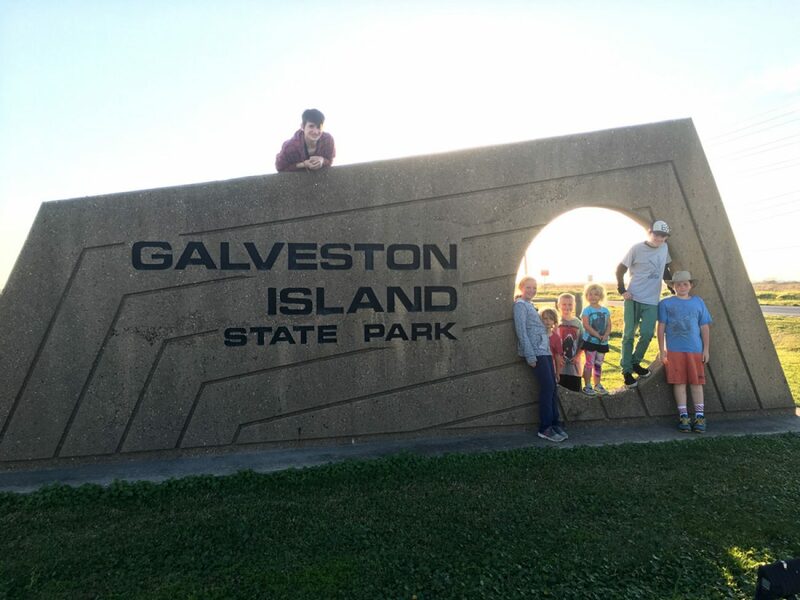 We were anxious to get to Galveston Island, not just because it’s on the coast but because my sister and her three boys were coming down to visit with us before she headed to Dallas for a job. 10 people in 300sq. ft., WHAT COULD POSSIBLY GO WRONG? We got to Galveston Island State Park and set up camp on the Bay Side. It was cold enough that the mosquitos weren’t out yet and we were so thankful. What a great park! We got the best spot (site 50, bayside) and we had a lot of open grass area to spread out. Not only our ‘yard’ but the campsites are set up in a big circle with a middle grassy area for everyone to enjoy. How great is that!?! There were fire pits set up around that encouraged community fires. It was so nice. We were so impressed with this campground. This is why we LOVE state parks. They’re our favorite by far! We were shocked at how new everything looked, but then we found out why. In 2008 a hurricane flattened the whole island and everything has been rebuilt. The bath house was so clean! Cleanest bath house we have visited at a State Park. My sister and her boys arrived late the same evening that we got there and it was SO good to see them all. We haven’t seen them since October last year and I’m not sure how long it will be before we see them again with us spending lots of time out West over the next year or two. We had so much fun exploring the [cold and windy] beach over the weekend. We took a ranger tour and learned quite a bit about the area. We found lots of cool things and learned about how they are helping build up the dunes from the last hurricane. It was very interesting. We got in several bike rides that weekend. We went on a few nature trails that turned out to be quite beautiful. We enjoyed the sunset every evening. We loved our time at the beach even though it was a tad bit cold. We hiked, we biked, we kayaked, the kids were outside all day and got some sun and some much needed vitamin D and we were so happy to have my sister and her boys there with us. We had perfect weather and it could not have been a better visit with them. We are so thankful for the time we have when our family is with us. It was so, so good to see them. Plus, we got a glimpse into what it will be like to have teenagers in our tiny house and let me tell you, it was awesome. My nephews have turned out to be so fun and awesome. My sister has done such an awesome job raising them up! She's my hero and I don't get to tell her enough how much she inspires me. If you plan on visiting the Galveston Island area, I highly suggest this state park. It was beautiful. Just be aware that although the camping rate is low, they do charge daily admission for adults and children over 12 which added an extra $30 to our stay that we weren’t planning on. Eveidently this is a Texas State Park thing cause we have never had to pay daily rates before. If you plan on spending time in the Texas State Parks, opt for a pass. We didn’t know about the pass until we heard from a friend that you can get a family pass for around $70 which will get you into all TX state parks for the year. I think we may end up doing the pass since we plan on visiting a few more state parks coming up soon. This is a great place for riding bikes, combing the beach, hanging out with friends, fishing and walking in a place with a great view. We loved our time there and would definitely stay there again. You will love the sunsets as much as we did, I just know it. Sidenote: If you stay here and enjoy a good pizza, drive down the road to Mario's Pizza. It was so good we only got picture of the one piece we had left over. Seriously, we know good pizza and this is it!! Thank you Mario's for the amazing pizzas! Now we're San Antonio bound!! Let's Talk About Beds, Baby!